County supervisors have honored two pioneering black scholars who left their mark on the Loudoun’s difficult racial past. Fred E. Drummond Jr. studied at St. Paul’s Polytechnic Institute; Indiana University; Hampton Institute, now known as Hampton University; Virginian State University; and George Washington University, in addition to serving in in the Army Air Force’s 447th Bombardment Group—a bomber group of the famed “Tuskegee Airmen,” which trained in the B-25 Mitchell but did not see combat. In 1953, Drummond joined the Loudoun County Public School system, which at that time was still racially segregated. He was both the principal and seventh-grade teacher at Banneker Elementary School. In 1958, he became the first principal of Frederick Douglass Elementary School in Leesburg. In 1954, the Supreme Court had ruled that racial segregation in schools was unconstitutional. Loudoun schools, following the trend of other Virginia schools, began desegregating only in 1963 by allowing black students to apply to transfer to white schools. In 1967, a federal judge ruled that practice did not go far enough, and desegregation work continued through 1969. At the same time, after 10 years at Frederick Douglass Elementary, Drummond went on to work as an assistant principal at Broad Run High School and Leesburg Elementary School, then retired in 1989 after 18 years as principal of Catoctin Elementary School. 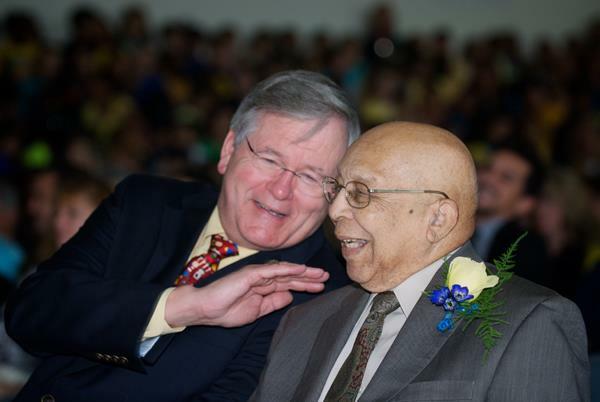 He served as an assistant principal and principal for 36 years, longer than anyone in Loudoun County Public Schools history. 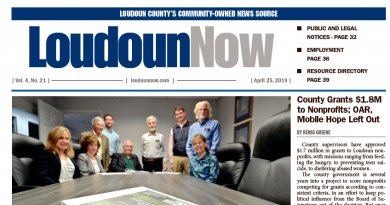 In 2012, he was named a Loudoun Laurel. Drummond died on March 13. Supervisor Kristen C. Umstattd (D-Leesburg) said Drummond “was probably one of the most revered educators in Loudoun County in its entire history.” The school system this year contemplated naming a new high school after him, but opted not to. Supervisors also honored author, historian, and Loudoun native Elaine Thompson. Thompson held a master’s degree from the Hampton Institute and authored “In the Watchfires: The Loudoun County Emancipation Association, 1890-1971,” a Purcellville history, among other works. Thompson served on the Loudoun Museum Board of Directors from 1997 to 2000, and received the Thomas Balch Library Advisory Commission’s History Award in 1998. In 2000, she won approval to erect a Virginia Department of Historic Resources highway marker at the Emancipation Grounds in Purcellville, and mounted an exhibit on the Loudoun County Emancipation Association for Purcellville Heritage Day. Some of those artifacts later found their way to a Library of Virginia exhibition. Also in 2000, she helped found the Thomas Balch Library’s Black History Committee. “For those of us who had the chance to sit at Elain Thompson’s knee and learn, what an amazing woman she was, and what an amazing blessing to all of us she was,” said County Chairwoman Phyllis J. Randall (D-At Large), who brought both ceremonial resolutions. One month before her death on Oct. 9, 2016, she donated artifacts from her own Loudoun County history to the Smithsonian National Museum of African American History and Culture.